It’s pronounced “Cordaleen” if you want to sound like a native. Maybe you don’t. Coeur d’Alene appears to have been a very sleepy town until the Coeur d’Alene Resort was constructed in 1989 by the Hagadone Corporation. The first video here is from the Port Falls on the Spokane river, this time in Idaho not Washington State. One of the still photos is of the river rushing below the dam (built in 1948 on top of earlier construction); the other is of the startlingly high bridge for I-90, one of America’s great east-west interstates. I live about 80 miles from the other end of highway I-90, which ends as the MassPike or Massachusetts Turnpike in Boston. 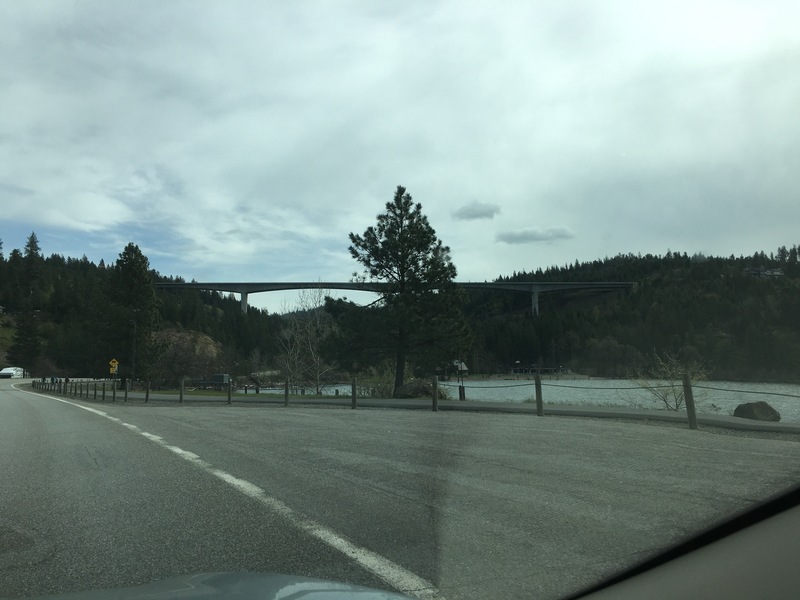 If I set out from Coeur d’Alene headed east, I’ll get home in five or six days. West, I’d arrive in Seattle eventually.